Monday 22nd February Yesterday was World Thinking Day, a day of showing appreciation and thanks among the many members of the Girl Guides and Girl Scouts around the world. To celebrate, Fellside children who are members of Rainbows and Brownies came to school dressed in their special uniforms. Some of the boys who are in Beavers and Cubs also joined in support. Don’t they all look great? In some of our photographs we were practicing the Brownie Guide ‘Promise’. Thank you children, for showing us your uniforms and well done for showing your support for your special day. 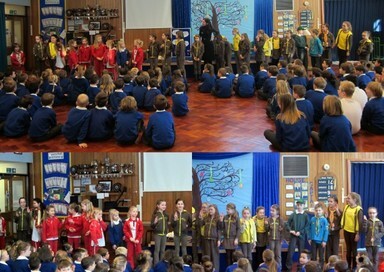 I enjoyed wearing my Brownies uniform on the 22nd of February to celebrate World Thinking Day. I enjoyed seeing everyone dressed up in their uniforms, they all looked great.